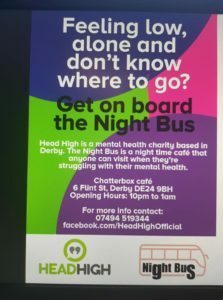 Derby City Life Links were thrilled to support the launch of Head High’s Night Bus on 10 January 2019. 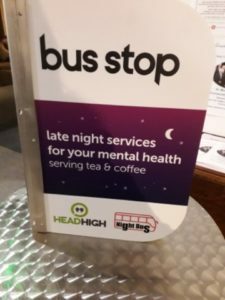 The Night Bus was launched by Amanda Solloway, and aims to provide a night time café for people who are struggling with their mental health or need someone to talk to. Opened on Friday 18 January, the Night Bus is run by a group of dedicated volunteers who provide a listening ear to anyone in need. The Night Bus is open every Friday and Saturday night between 10pm-1am, and is based at Chatterbox Café, 6 Flint Street, Allenton, DE24 9BH. The opening night was well attended with lovely food and an abundance of well wishers including Councillor Mike Carr, the Mayor of Derby and Hardyal Dhindsa, Derbyshire’s Police and Crime Commissioner. The Night Bus also has the support of the community of St. Martin’s Church in Allenton – a local hub in the community which hosts the café. For more information about the Night Bustake a look at their Facebook page or give them a call on 07494519344. We wish this project every success!